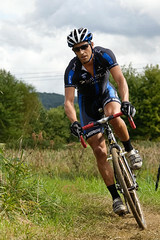 Weston Schempf (C3‑Athletes Serving Athletes) began the defense of his 2008 Men’s Elite MABRA Cyclocross Series championship by winning the 2009 series opener, the Ed Sander Memorial Cyclocross. The race benefits a college scholarship fund for Chris Sander, whose father was killed in a training accident. The late Ed Sander’s NCVC teammates put on the annual race at the Lilypons Water Gardens in Buckeystown, Maryland. Schempf sets the pace at the front. Schempf, C3 teammate Andrew “Bad Andy” Wulfkuhle, and the Haymarket Bicycles duo of Joe Dombroski and Jared Nieters, established an early lead group on the muddy, rutted Lilypons course. Wulfkuhle and Nieters dropped off the pace after a couple laps leaving Schempf and Dombroski to trade blows. In the finale, Schempf was able to outgun Dombroski, who pulled out of his pedal just as he started winding up for the sprint. Along with being the reigning MABRA champ, Schempf is also the defending MAC Cyclocross Series champ and placed third at last season’s 30-34 U.S. National Cyclocross Championship. We caught up with Wes to get his thoughts on how the Ed Sander race played out. Did you change your preparation at all to deal with the conditions? Did you pre-ride the course? Schempf: No change for my preparations. I didn’t pre-ride the course, but walked the prologue and the course from the start to the first pit entrance. What was your approach to the long muddy sections? Did you ride, run, a little of each? Can you walk us through the decisive moment in your race? Where the day was won or lost. Schempf: Looking back, the decisive moment was the sprint. I heard that Joe pulled out of his pedal in the sprint but didn’t see proof until looking at the video and pictures of the race. I was confident the entire race with my equipment and with my ability to win in a sprint. What type of wheels and tires did you run? What psi? Did you change your bike or wheels at all during the race? Schempf: Bontrager Deep Dish carbon tubular front with a Challenge Grifo 34mm at 36 psi and a Bontrager Race X Lite tubular rear with a Dugast Typhoon 32mm at 34 psi. No bike change needed. What kind of gearing are you riding? Schempf: 44/38 with a 12-27 on my race bike and 46/39 compact 12-27 on my pit bike. Now that ‘cross season is in full swing, what is your training schedule throughout the week? Schempf: Ride as much as I can. Rest day (active recovery or off bike) Mondays. Intervals Tuesday and Wednesday. Ride Thursday and rest or race prep on Friday. I probably train 5-6 hrs during the week. What bike and components are you riding? Did you change anything from last season? Schempf: I’m excited to be on the new Blue Norcross. This is their full carbon cross specific frameset. It has a huge 1 1/2 inch diameter steerer tube that narrows to 1 1/8 up top so that makes the front end super stiff. A newly designed bottom bracket area that is oversized to stiffen the rear end and the entire frame has a new tubeset design. The best cross bike I’ve ridden in a long time. Wheels are Bontrager Race X lites or Carbon Race XXXL—super stiff and really durable. Shifting is mainly SRAM Force with a Rival Front derailleur on one bike. Stem, seatpost, seat are Bontrager. Brakes are TRP Magnesiums. Really light, pimp white and very adjustable. Tires are Dugast Typhoons 32mm or Dugast Flying Doctors 32mm or FMB World Cup Sprint 34mm. Kits are by Verge. Shoes are Bontrager RXL Mountain. Very stiff and light. What did you have for breakfast on race day? Schempf: A bowl of cereal at 10am, then a turkey, avocado, tomato, cheese sandwich with some grapes for lunch about noon. Schempf: I’d like to thank my sponsors C3-Athletes Serving Athletes, Blue Competition Cycles, Bontrager Hostetter Insurance, and SRAM for their support. I’d also like to thank my fantastic teammates and friends who have drank the KoolAid and joined the DarkSide.